The “WebPageViewer” extension which will be installed with the QlikView installation (C:\Program Files\QlikView\Examples\Extensions\ExtensionExamples.qar) contains a little bug. 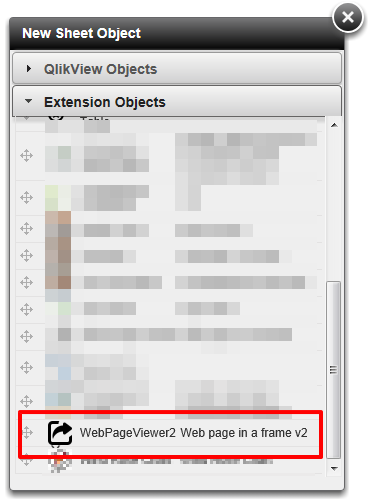 That’s why I have created a new QlikView extension called “WebPageViewer2” with some little improvements. 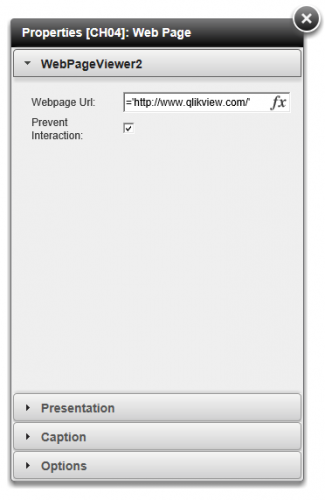 The purpose of this QlikView extension is easy to describe: Integrate an existing web page into an existing QlikView application by just defining the Url of the web page. The standard WebPageViewer extension does not allow to place multiple instances of the extension on one sheet. I have fixed this in WebPageViewer2. If this option is ticked the user will not be able to interact with the web page loaded in the extension (e.g. clicking on links, etc. I will describe in one of my next posts a scenario why I needed this new functionality for a concrete project. and tagged Extensions, QlikView 11. Bookmark the permalink. Both comments and trackbacks are currently closed.